Teal Gardner’s contribution to the Urban Design Lab was Reading the City, a platform or methodology in which the researchers met with various artists and urban design experts in the Omaha and made forays into the urban environment equipped with the recording tools (audio, photo, video, notebook, memory) necessary to capture and reproduce real and imagined elements of city life. 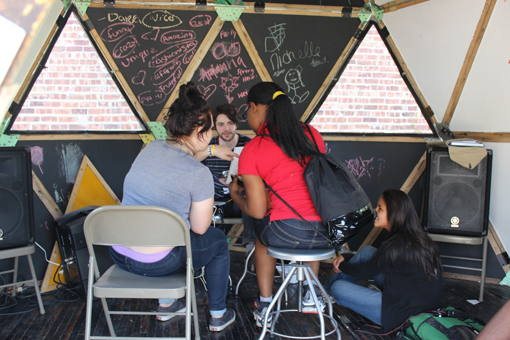 Wednesdays and Thursdays in Urban Design Lab were structured as a series of workshops organized by co-lead artist, Teal Gardner, and led by professionals in the community. 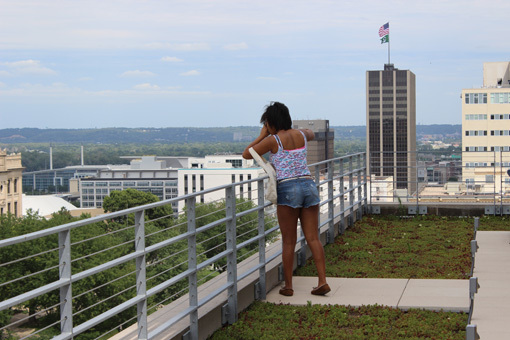 Ranging from city planners to poets, these individuals provided specific lenses through which Urban Design Lab researchers could investigate the city of Omaha. Workshops followed a trajectory that moved from concrete readings of the city (transportation infrastructure, landscape architecture, public/private space distinctions, how and why the city is planned the way it is) to embodied, creative, and abstract methods of responding to the city (recording and manipulating city sounds, poetry writing, language-sprawls, photography, and drawing). 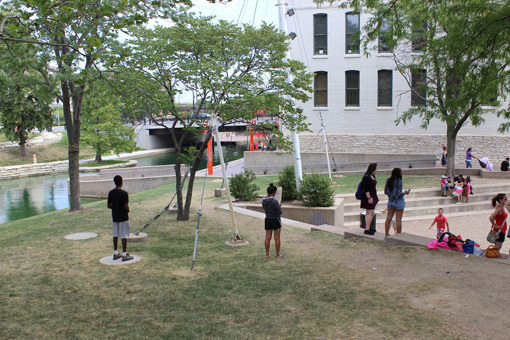 The workshops also created a launchpad for activity: researchers made forays into the city, opening an on-the-ground investigation of Omaha. Read on for information on each workshop! Dr. Samantha Senda-Cook teaches communications at Creighton University. She shared a mode of reading the city through evaluating the rhetorical arguments made by spaces themselves, taking into account the entertainment economy that is prevalent in the Old Market. Researchers walked with Dr. Senda-Cook through the cobbled streets of Downtown, seeking to understand the surface semiotics of the city, and the effects of design decisions on on the public. Back in the Lab, researchers designed hypothetical “tactical urbanism” interventions that provided services, created temporary communities, and otherwise adorned or amended the urban landscape. Stephen Osberg is an Omaha city planner whose expertise is in transportation. 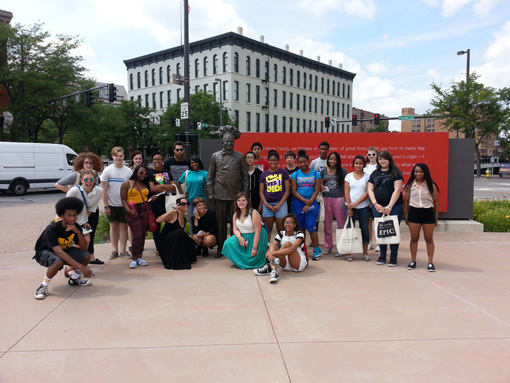 Walking around with Stephen opened researchers’ eyes to the why and how of Omaha’s transportation infrastructure. In a guided exploration of downtown, researchers encountered miles of parking lots and garages, crossed four lane highways, and absorbed the atmosphere under the 4-80 overpass. As a group, Urban Design Lab considered the causes and implications of preferring the automobile over other forms of transportation in Omaha. Alex Priest guided a workshop which sought to understand the role of the landscape architect within urban design. 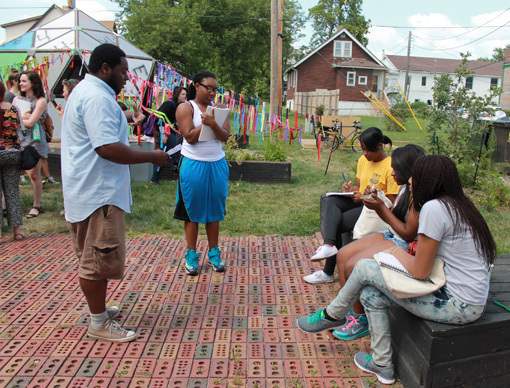 Researchers engaged in a mock-redesign of the garden space on the Bemis dock, a process that resulted in formal architectural presentations of their re-worked gardens. Jed Moulton, a city planner in the Omaha Planning Department, created four large maps of Omaha, which are hanging in the Urban Design Lab. They depict Omaha at different scales and reveal the contours and imprints of buildings, streets and waterways that shape the city. Moulton invited the researchers to the planning department, where they heard a presentation that introduced the guiding concepts behind large-scale design decisions on a in Omaha. Poets Lisa Lux, Amanda Huckins, Devel Crisp and Ruth Kohtz led a day-long poetry workshop during which researchers answered provided prompts. Poems were created using available language derived from scouring the urban environment, responding to the city as a metaphorical lover, divesting oneself from knowledge of city structures and inventing new purposes or meanings for the structures, and fleshing out a metaphorical building, intended to represent the individual’s life and values. Poems were accumulated into chapbooks which are available for free in the Urban Design Lab space. Nicholas Holden is an Omaha musician who brought his particular concern to the researchers: using sound as material for creating unique sonic spaces. Researchers explored the N 24th street area, using deep-listening techniques to find sounds, which were recorded. The sounds were then processed by Holden and the teams of researchers into a cumulative soundscape, which can be heard in the Urban Design Lab space, and is available for streaming on SoundCloud.